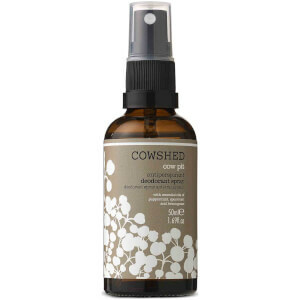 Feel confident with the Cowshed Cow Pit Cream Deodorant; a herbal anti-perspirant cream that soothes and conditions skin, whilst lending the underarms a refreshing scent. Utilising a skin-loving blend of Organic Aloe Vera and Shea Butter, the formula not only helps you to feel dry and confident, but works to condition the underarms to ensure skin is calm, comfortable and healthy. Peppermint, Spearmint and Lemongrass Essential Oils work in synergy to envelop skin in a refreshing scent, whilst offering antimicrobial and antiseptic properties. Pump a small amount of cream onto your fingertips and apply to centre of underarm. Rub in gently until absorbed.